LZ and JSC contributed equally to this work. Sepsis is a leading cause of death in intensive care units and accounts for an estimated 250,000 deaths per year in the United States (1). Generally, the pathophysiology of the septic response occurs in two distinct phases: the initial hyperdynamic phase which is dominated by innate immune system overactivity and a later, immunosuppressed phase in which adaptive immunity fails to protect the host from opportunistic infections (2,3). Macrophages are key regulators of both innate and adaptive immune responses during sepsis. They function in eliminating invasive bacteria, producing cytokines and participating in antigen presentation. Autophagy is a process by which cells degrade and recycle nonessential and/or redundant components. It has been demonstrated to be essential for cellular homeostasis, cell defense and adaptation to adverse environments (4,5). Autophagy participates in the clearance of intracellular bacteria, viruses and protozoa from host cells. It also affects diverse immunologic functions, including inflammatory cytokines secretion, antigen presentation and lymphocyte development (6,7). Autophagy has been shown recently to be activated in sepsis and has been shown to negatively regulate inflammation (8, 9, 10, 11). Lipopolysaccharide (LPS) LPS can induce autophagy in both cardiomyocytes and macrophages (12,13). Recently, it has been shown that in hepatocytes, sepsis or LPS can induce autophagy, which serves as a protective mechanism that guards against hepatocellular death both in vivo and in vitro (14). Furthermore, autophagydeficient mice show greater susceptibility to LPS administration, indicating a protective role for autophagy in sepsis (15). Interestingly, an emerging paradigm is the concept that the reciprocal relationship between autophagy and apoptosis may influence cellular survival. The inhibition of autophagy during stressful circumstances results in accelerated apoptotic cell death (16) while increased autophagy promotes cell survival by inhibiting apoptosis (12,17, 18, 19). Interferon regulatory factor 1 (IRF-1) was the first of nine identified mammalian members of the IRF family of transcription factors. Initially recognized as a key regulator of type I interferon production, IRF-1 has subsequently been described to participate in a number of cellular processes including proliferation, the response to tumors and viruses, and immune modulation (20). Specifically in regards to apoptosis, IRF-1 functions as a pro-apoptotic signal in vitro in both primary and tumor cell lines (21, 22, 23). Overexpression of IRF-1 enhances the sensitivity of DNA damage induced apoptosis in T lymphocytes (24). IRF-1 also participates in mortality associated with disease models mediated by TNFα and IFNγ (25). The present study investigates the role that IRF-1 plays in regulating autophagy in murine macrophages in response to LPS stimulation. We found IRF-1 regulates both autophagic and apoptotic responses in LPS-stimulated macrophages. Macrophages obtained from IRF-1 knockout (KO) mice experience increased autophagy and decreased apoptosis compared to wild-type (WT) macrophages in the setting of LPS stimulation. Downstream of IRF-1, we find that inducible nitric oxide synthase (iNOS)-dependent nitric oxide (NO) exerts an inhibitory effect on autophagy through the activation of mammalian target of rapamycin (mTOR). Therefore, we propose a novel, previously undescribed role for IRF-1 and iNOS/NO in negatively regulating autophagy in macrophages in the setting of LPS stimulation. 3-Methyladenine (3-MA) and LPS from E. coli 0111:B4 was obtained from Sigma-Aldrich (St. Louis, MO, USA). Rabbit polyclonal IRF-1 (M-20) antibody, rabbit caspase-3, cleaved caspase-3 antibody, cleaved caspase-8 antibody, cleaved caspase-9 antibody, histone H3 antibody, mTOR/p-mTOR antibody, and P70S6/p-P70S6 antibody were all from Cell Signaling (Boston, MA, USA). Rabbit anti-light chain 3B (LC3B) antibody and rabbit p62 antibody were from NOVUS (Littleton, CO, USA), β-actin antibody from Sigma-Aldrich. ApopTag® Peroxidase In Situ Apoptosis Detection Kit from Chemicon (Millipore, Billerica, MA, USA). (±)-S-Nitroso-N-acetylpenicillamine (SNAP) was from Calbiochem (San Diego, CA, USA) and LN6-(1-Iminoethyl)-lysine (lNIL) was from ENZO (Plymouth Meeting, PA, USA). Rat anti-mouse CD11b-phycoerthrin (PE) was purchased from PharMingen (San Diego, CA, USA). Male B6.129S2-irf1tm1Mak/J (IRF1-KO) and matched C57BL/6J mice (8, 9, 10 wks) were purchased from the Jackson Laboratory (Bar Harbor, ME, USA). Animals were maintained in a laminar flow, specific pathogen-free atmosphere at the University of Pittsburgh. The Animal Care and Use Committee of the University of Pittsburgh approved protocols. Experiments were performed in adherence to the National Institutes of Health Guidelines for the Use of Laboratory Animals (26). Male IRF1-KO and matched C57BL/6 mice were injected intraperitoneally (i.p.) with a lethal dose of LPS (20 mg/kg). Control mice received injections of sterilized phosphate buffered saline (PBS). Sixteen hours following PBS or LPS (20 mg/kg) administration, alveolar macrophages, splenic macrophages and Kupffer cells were isolated. Splenic CD11b+ (Mac-1+) cells were enriched by labeling with PE-conjugated anti-CD11b monoclonal antibody (mAb). Labeled cells were selected with anti-PE immunomagnetic beads according to the manufacturer’s instructions (Miltenyi Biotec, Auburn, CA, USA) as described previously (27). Mice alveolar macrophages were isolated by bronchoalveolar lavage as described previously (28). Liver Kupffer cells were isolated using a modification of the perfusion technique as described previously (29,30). Primary peritoneal macrophages were isolated from celiac lavage for further in vitro study. Ten thousand cells per well were placed on 96-well plates in 100-µL media and were examined under light microscopy. Cell viability was evaluated using the conventional MTT reduction assays. For the MTT reduction assay, cells of each micro well were incubated with 20 µL 5 mg/mL MTT (Sigma-Aldrich) solution in PBS for 4 h at 37°C, and the reaction was stopped by adding 150 µL per well extraction buffer. After overnight incubation with extraction buffer, the optical density (OD) at 562 nm was measured. Cell viability was shown as fold change relative to control. Peritoneal macrophages were harvested by lavage from IRF-1 KO and matched C57BL/6 mice (WT). Peritoneal macrophages were cultured in RPMI 1640 (Lonza, East Rutherford, NJ, USA) supplemented with 5% FCS (Sigma-Aldrich), 10 mmol/L 4-(2-hydroxyethyl)-1-piperazine ethanesulfonic acid (HEPES), 1 mmol/L glutamine, 50 U/mL penicillin, and 50 µg/mL streptomycin (Cellgro/Mediatech, Manassas, VA, USA). After 3 h of adherence, cells were washed twice and then were treated with agent for the indicated time periods. Murine monocyte-like/macrophage-like cells (RAW264.7, American Type Culture Collection, Baltimore, MD, USA) were cultured in Dulbecco’s Modified Eagle Medium (DMEM) with 10% FCS, 50 U/mL penicillin, and 50 µg/mL streptomycin and stimulated as indicated, after which time whole cell lysates were harvested and subjected to Western blot. Triton X-100, 1 µmol/L sodium orthovanadate, 100 µmol/L DTT, 200 µmol/L phenylmethylsulfonyl fluoride (PMSF), 10 µg/mL leupeptin, 0.15 U/mL aprotinin, 50 mmol/L sodium fluoride, 10 mmol/L sodium pyrophosphate, 2.5 µg/mL pepstatin A, 1 mmol/L benzamidine, and 40 mmol/L α-glycerophosphate) for 45 min, then centrifuged at 2,000g for 15 min at 4°C. Protein concentration was quantitated with bicinchoninic acid protein assay reagent (Pierce Chemical Co, Rockford, IL, USA). For nuclear protein isolation, the cell pellet was lysed with NE-PER nuclear and cytoplasmic extraction reagent (Thermo Scientific, Carlsbad, CA, USA). Protein obtained from cultured cells or tissue was electrophoresed in 8% to 15% sodium dodecyl sulfate-polyacrylamide gel electrophoresis (SDS-PAGE) gels and then transferred to Trans-Blot nitrocellulose membranes (Bio-Rad Laboratories, Berkeley, CA, USA) which were blocked for 1 h at room temperature with 5% nonfat milk and then incubated in an horseradish peroxidase (HRP)-conjugated secondary antibody against the primary antibody at room temperature for 1 h. Membranes were developed with the Super Signal West Pico chemiluminescent kit (Pierce Chemical Co.) and exposed to film (Eastman Kodak, Rochester, NY, USA). Densitometry was performed by the National Institutes of Health (Bethesda, MD, USA) Image J to quantify OD. To confirm apoptosis in peritoneal macrophages, terminal deoxynucleotidyl transferase dUTP nick end labeling (TUNEL) staining was performed. Peritoneal macrophages at a density of 1 × 106 cells/mL were placed on sterilize cover slides in 6-well plate. After LPS treatment, cells were washed with PBS and fixed in 4% paraformaldehyde (PFA) for 30 min. Endogenous peroxidase was quenched using 3% hydrogen peroxide for 5 min. Then, cells were permeabilized with 0.2% Triton X-100 for 5 min. Slides were placed in a moist incubation chamber and covered with an equilibration buffer for 5 min which was then tapped off. Next, the TdT enzyme was added and slides were incubated at 37°C for 1 h. After washing in PBS, antidigoxigenin peroxidase was added and incubated for 30 min at room temperature and slides were washed in PBS. The reaction is developed using the 3,3′-diaminobenzidine (DAB) chromogen for 10 min, washing in distilled water and counterstaining 1 min in Mayer hematoxylin (Invitrogen, San Diego, CA, USA). Slides were dehydrated through a series of alcohols and xylene then mounted and cover slips added. Peritoneal macrophages were treated as described in the text and then washed three times with PBS prior to being fixed in 2% paraformaldehyde and permeabilized in 0.1% Triton X-100 (Sigma-Aldrich). Next, cells were rehydrated with three washes of PBS, washed five times with 0.5% bovine serum albumin (BSA), and blocked with 2% BSA for 45 min. After blocking, cells were washed five times with 0.2% BSA before being incubated with primary antibody (anti-LC3B; NOVUS), diluted 1:200 for 60 min, after which time, they were washed again five times with 0.2% BSA, incubated with Alexa 488-conjugated secondary (Invitrogen, diluted 1:500) for 60 min, and then washed again five times in 0.2% BSA. Confocal analysis was performed on an Olympus Fluoroview 500 confocal microscope. Two hundred thousand RAW 264.7 cells were plated in 2 mL of growth medium without antibiotics in each well of a 6-well plate. Cells were transfected at 40% confluency with the indicated specific constructs or a nonspecific scrambled silencing sequence for 24 h according to the manufacturer’s instruction. siBeclin-1, control siRNA and fluorescein isothiocyanate (FITC)-conjugated control siRNA were from Santa Cruz (Santa Cruz, CA, USA). For each transfection, 6 µL siRNA were diluted in 100-µL transfection medium (siRNA final concentration is 60 pmol/well). 6-µL transfection reagents were diluted in 100-µL transfection media. These two solutions were combined and were incubated at room temperature for 45 min. This transfection mixture was added to each well and was incubated for 12 h, after which it was replaced by 1-mL growth medium. Transfection efficiency was determined at 24 h by fluorescence microscopy and flow cytometry. Adenoviral IRF-1 (AdIRF-1) was an E1- and E3-deleted recombinant adenovirus encoding murine IRF-1. The control vector of adenoviral lacZ (AdlacZ) was the same adenoviral vector encoding lacZ. All the adenoviral vectors were propagated and purified in Vector Core Facility, University of Pittsburgh. Titers of viral particles (vp) were determined by optical densitometry, and plaque-forming unit (pfu) concentrations were confirmed by formal plaque assay technique. The adenovirus transfection protocol for RAW264.7 cells was as follows: 1 × 105 RAW264.7 cells were plated into 6-well plates. Different multiplicities of infection (MOIs) for transfection were used to determine the optimal concentration for IRF-1 expression with minimal associated viral toxicity. Cells were harvested 48 h after transfection for nuclear protein or whole cell protein extraction. Cells were fixed in cold 2.5% glutaraldehyde in PBS. The specimens were postfixed in 1% osmium tetroxide with 0.1% potassium ferricyanide, dehydrated through a graded series of ethanol (30% to 90%) and embedded in Epon. Ultrathin sections (65 nm) were stained with 2% uranyl acetate and Reynolds lead citrate, and imaged on a JOEL JEM-1100 transmission electron microscopy (TEM). Secretion of NO by macrophages was measured by spectrophotometric determination of nitrite, the stable end product of NO oxidation, as described previously. Supernatants from macrophage cultures were mixed with an equal volume of Griess reagent (one part 0.1% N-[1-naphthyl]-ethylenediamine in water and one part 1% sulfanilamide in 5% phosphoric acid), and the absorbance at 570 nm was measured and compared with a NaNO2 (1–100 mmol/L) standard curve. Survival rates were analyzed with Kaplan-Meier survival curves. Values are expressed as means ± SEM. Groups were compared by SPSS16.0. A P value of <0.05 was considered statistically significant. IRF-1 KO mice have previously been shown to be resistant to LPS-induced lethality (25). We confirmed this finding in our lethal model of endotoxemia (data not shown). As one of the predominant cell types in the reticuloendothelial system, macrophages are key regulators of immune function. To determine the role of IRF-1 in the regulation of autophagic and apoptotic responses in murine macrophages, WT and IRF-1 KO mice were injected with LPS (20 mg/kg) and splenic macrophages, alveolar macrophages and liver Kupffer cells were isolated after 16 h. Splenic macrophages from IRF-1 KO mice demonstrated an increase in the active form of LC3B, LC3B-II, which is a biomarker for autophagosomes. They also demonstrated decreased apoptosis following LPS administration as demonstrated by decreased caspase-3 cleavage (Figure 1A). 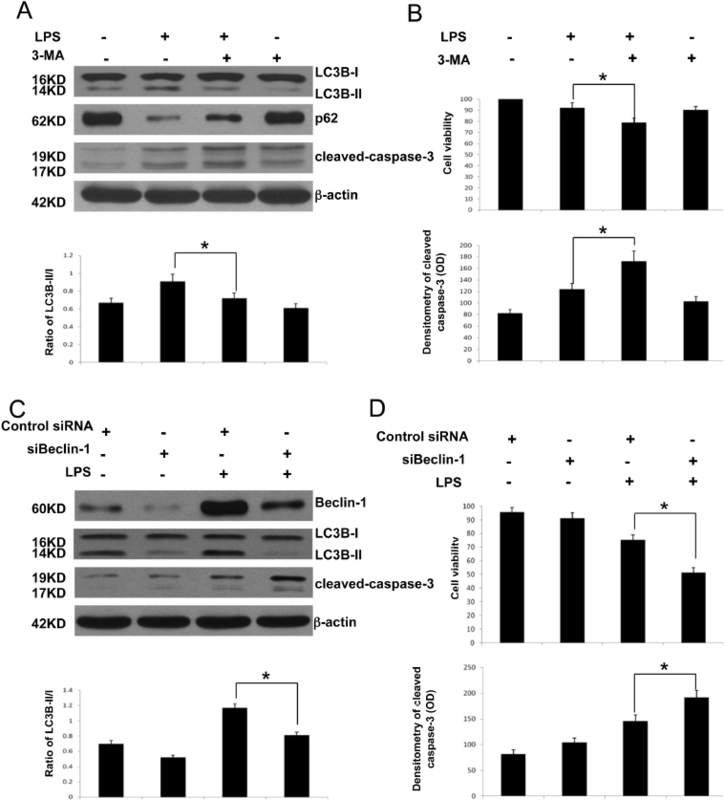 Similarly, alveolar macrophages (Figure 1B) and liver Kupffer cells (Figure 1C) from IRF-1 KO mice also showed increased LC3B-II activation and decreased caspase-3 cleavage following LPS administration. These experiments suggest that IRF-1 may promote apoptosis and inhibit autophagy in vivo in macrophages following LPS administration. Macrophages from IRF-1 KO mice exhibit decreased apoptosis and increased autophagy during endotoxemia. (A) Following PBS or LPS (20 mg/kg) administration for 16 h, splenic macrophages were isolated from WT and IRF-1 KO mice and analyzed by Western blot for LC3B I/II and cleaved caspase-3. (B) Following PBS or LPS (20 mg/kg) administration for 16 h, alveolar macrophages were isolated from WT and IRF-1 KO mice and analyzed by Western blot for LC3B I/II and cleaved caspase-3. (C) Following PBS or LPS (20 mg/kg) administration for 16 h, liver Kupffer cells were isolated from WT and IRF-1 KO mice and analyzed by Western blot for LC3B I/II and cleaved caspase-3. Results are representative of three separate independent experiments. To expand on our in vivo findings, we moved to an in vitro system to confirm the role of IRF-1 in regulating the autophagic response in LPS-stimulated macrophages. Using peritoneal macrophages from IRF-1 KO and WT mice, we found that those obtained from KO mice experienced increased autophagic flux in response to LPS stimulation compared to those obtained from their WT counterparts, as demonstrated by increased cytoplasmic LC3B immunofluorescence (Figure 2A). 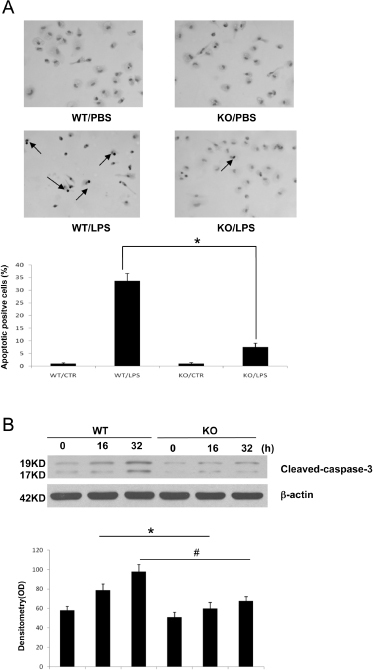 Furthermore, TEM images confirmed this increase in autophagic flux as increased numbers of double membrane bound autophagosomes were seen in IRF-1 KO macrophages compared to WT cells (Figure 2B). Finally, Western blot analysis of IRF-1 KO macrophages demonstrated increased LC3B-II and increased p62 degradation (a multidomain protein adaptor whose degradation is enhanced by autophagy) as compared to WT macrophages (Figure 2C). These results further suggest that IRF-1 may inhibit the autophagic response in LPS-stimulated macrophages. Peritoneal macrophages from IRF-1 KO mice demonstrate increased autophagy in response to LPS stimulation. (A) Peritoneal macrophages from C57BL/6 and IRF-1 KO mice were isolated and treated with/without LPS (1 µg/mL) for 16 h; Immunofluorescent confocal microscopy was then performed (magnification 600×). (B) Peritoneal macrophages were isolated from WT and IRF-1 KO mice and stimulated with LPS (1 µg/mL) for 16 h and analyzed by TEM for autophagosomes and autolysosomes (magnification 25,000×). Scale bars = 500 nm. (C) Peritoneal macrophages were isolated from WT and IRF-1 KO mice and stimulated with LPS (1 µg/mL) for 16 h and were analyzed by Western blot for LC3B I/II and p62. *P < 0.05; results representative of three separate independent experiments. Similarly, we sought to determine using in vitro studies whether IRF-1 in fact promotes apoptosis in LPS-stimulated macrophages. We elicited peritoneal macrophages from IRF-1 KO and WT mice and found that those obtained from KO mice exhibited less TUNEL positive cells in response to LPS stimulation (Figure 3A). Also, following LPS treatment for 16 h and 32 h, peritoneal macrophages from IRF-1 KO mice demonstrated decreased caspase-3 cleavage (Figure 3B). These results suggest that IRF-1 plays a role in regulating not only the activity of autophagy, but also that of apoptosis in macrophages following LPS exposure. Peritoneal macrophages from IRF-1 KO mice demonstrate decreased apoptosis in response to LPS stimulation. Peritoneal macrophages were isolated from WT and KO mice and were treated with/without LPS (1 µg/mL) stimulation for 16 h or 32h and were analyzed by (A) TUNEL staining or (B) cleaved caspase-3 by Western blot. *,#P < 0.05; results representative of three separate independent experiments. Some debate exists regarding the precise role of autophagy as it relates ultimately to the fate of cells under stressful stimuli. One school of thought suggests that autophagy is always a protective, adaptive response to stress and that cells can go on to die in spite of this adaptive response while a second school of thought suggests that excessive autophagy activation in and of itself can lead to cell death in the absence of other known pathways. To further examine the function of autophagy in LPS-stimulated macrophages, RAW264.7 cells were pretreated with the autophagy inhibitor, 3-MA, or with Beclin-1 siRNA. Both 3-MA and Beclin-1 siRNA treatment inhibited LPS-induced autophagic flux while inducing apoptotic signaling in macrophages (Figures 4A, C). Furthermore, inhibition of autophagy led to increased cell death as shown by MTT cell viability assay results (Figures 4B, D). These results provide further evidence that the autophagic response is a protective mechanism in LPS-stimulated macrophages. Decreased autophagic flux in IRF-1 WT macrophages leads to apoptotic cell death. (A) RAW264.7 cells were pretreated with the autophagy inhibitor 3-MA (5 mmol/L) for 1 h prior to LPS (500 ng/mL) stimulation. 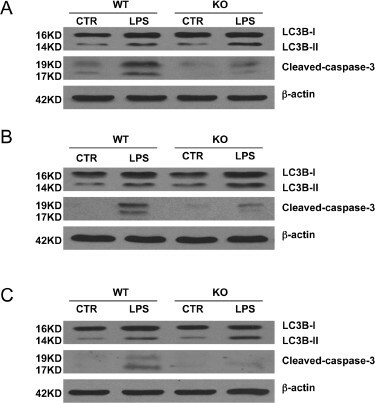 Following LPS stimulation for 16 h, cells were analyzed by Western blot for LC3B I/II, p62 and caspase-3 cleavage. (B) Cell viability was analyzed by MTT assay. (C) RAW 264.7 cells were transfected with siBeclin-1 for 24 h prior to LPS (500 ng/mL) stimulation. Following LPS stimulation for 16 h, cells were analyzed by western blot for LC3B I/II, p62 and caspase-3 cleavage. (D) Cell viability was analyzed by MTT assay. *P < 0.05; results representative of three separate independent experiments. Of the known regulators of autophagy, the mTOR is among the most well characterized, with mTOR serving as a negative regulator of autophagy. Furthermore, one of the most well described downstream targets of IRF-1 activation is the inducible nitric oxide synthase (iNOS), which can be activated transcriptionally by IRF-1. To further explore the mechanism of how IRF-1 modulates autophagy in macrophages, and whether IRF-1-induced iNOS activation participates in this process, overexpression of IRF-1 in RAW264.7 cells was carried out using an adenoviral vector (AdIRF-1), with AdLacZ used as a control (Figure 5A). IRF-1 overexpression resulted in increased iNOS expression and subsequent increased NO production (Figure 5B), even in the absence of LPS stimulation. Conversely, peritoneal macrophages from IRF-1 KO mice exhibited minimal iNOS activation following LPS exposure compared to cells obtained from WT mice. This decrease in iNOS activation observed from KO cells was associated with decreased phosphorylation of mTOR and its downstream target P70S6 (Figure 5C). Finally, AdIRF-1 overexpression, in and of itself (in the absence of LPS stimulation), resulted in an increase in the phosphorylation status of both mTOR and P70S6 and a concomitant decrease in the activity of autophagy as measured by Western blot analysis for LC3B I/II. This effect was reversed by pretreatment with the selective iNOS inhibitor L-NIL (Figure 5D). These findings suggest that IRF-1 activation leads to the induction of iNOS, which then exerts an inhibitory effect on autophagy by activating the mTOR/P70S6 signaling pathway. IRF-1 inhibits autophagy through iNOS/mTOR/P70S6 in vitro. (A) AdIRF-1 infection induced IRF-1 overproduction. AdLacZ and AdIRF-1 infected RAW 264.7 cells for 24 h at either an MOI of 100 or 200 and Western blot analysis for IRF-1 expression was performed. (B) RAW cells were infected with AdIRF-1 at an MOI of 200 for 24 h; cells were then harvested for iNOS expression. Griess assay confirmed NO production following AdIRF-1 infection. (C) Peritoneal macrophages were isolated from WT and IRF-1 KO mice and stimulated with LPS (1 µg/mL) for 16 h and analyzed by Western blot for iNOS, p-mTOR and p-P70S6. (D) RAW cells were infected with AdIRF-1 at an MOI of 200 for 24 h and were treated with L-NIL (200 µmol/L) for 16 h. Cells were then harvested for Western blot of p-mTOR, p-P70S6, LC3B I/II and P62. *,#P < 0.05. Results representative of three separate independent experiments. Not only does NO play a pivotal role in endotoxin-induced apoptosis (31, 32, 33, 34, 35), it has also been shown recently to inhibit autophagy (36). To determine whether NO production through iNOS mediates the effects of IRF-1 on autophagy in LPS-stimulated macrophages, we used the NO donor, SNAP. SNAP treatment resulted in the phosphorylation of mTOR/P70S6 and inhibited autophagy in RAW264.7 cells. This response occurred in a dose-dependent manner (Figure 6A). 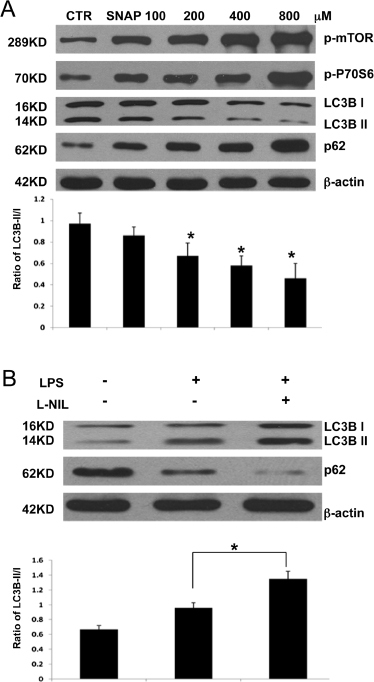 Conversely, RAW 264.7 cells treated with L-NIL, a selective inhibitor of iNOS, exhibited increased autophagy in response to LPS stimulation as demonstrated by Western blot (Figure 6B). Combined, these data support the hypothesis that IRF-1-induced iNOS activation and subsequent NO production may modulate autophagy in macrophages in the setting of LPS activation. NO/iNOS mimics the effects seen in IRF-1 overexpression on autophagy in RAW264.7 cells. (A) Raw cells were pretreated with serum-free media for 12 h and then stimulated with a different dose of SNAP, an NO donor for 16 h. Cells were harvested for western blot analysis for p-mTOR, p-P70S6, LC3B I/II and P62. *P < 0.05; Results representative of three separate independent experiments. (B) RAW 264.7 cells were pretreated with L-NIL (200 µmol/L) for 1h and then stimulated with LPS (500 ng/mL) for 16 h. Cells were harvested for Western blot analysis for LC3B and p62. *P < 0.05; results representative of three separate independent experiments. Despite major advances in critical care management and antibiotic therapies, sepsis remains a challenging clinical problem. Mortality rates have been estimated to range between 30% to 70% and annual health care costs exceed $15 billion; moreover, its incidence is believed to be increasing at a rate of 1.5% each year (37). Traditionally, sepsis has been considered as an overwhelming inflammatory response, the end result of which is end organ failure, and, ultimately, death. However, numerous clinical trials in which agents that block the inflammatory cascade, such as antiendotoxin antibodies (38), tumor necrosis factor (TNF) antagonists (39), interleukin-1 (IL-1) receptor antagonists (40) have failed to improve the outcome of sepsis. The failure of new treatments to impact outcome in sepsis highlights the fact that there is still much to learn about the mechanisms of the septic response. Recent studies confirm that autophagy is a protective response in the setting of LPS stimulation (9), and previous studies have demonstrated that IRF-1 regulates outcomes in disease models mediated by TNFα and IFNγ, including endotoxemia. Therefore, in the present study, we chose to focus on the previously unexplored role of IRF-1 in modulating the autophagic response in LPS-stimulated macrophages. We, for the first time, show that tissue-derived macrophages from LPS-stimulated IRF-1 KO mice exhibit differential responses in regards to both autophagy and apoptosis compared to their WT counterparts with KO macrophages exhibiting more autophagy and less apoptosis. Furthermore, we found that overexpression of IRF-1 is alone a sufficient enough stimulus to inhibit autophagy from baseline levels. Once we established a link between IRF-1 activation and the regulation of autophagy in macrophages in the setting of LPS stimulation, we investigated the downstream mechanisms by which IRF-1 might regulate this important cellular process. Our data provides evidence to support that IRF-1 activation inhibits autophagy by modulating mTOR/P70S6 activity. We further demonstrate that the inhibitory effects of IRF-1 on autophagy through mTOR activation were mediated by iNOS and NO, well described downstream effectors of IRF-1. NO, an important cellular messenger, is capable of eliciting a number of physiological responses. NO inhibits autophagy in neurons, HeLa cells and HEK cells. Inhibition of c-Jun N-terminal kinase (JNK) by NO reduces Bcl-2 phosphorylation, and increases Bcl-2/Beclin-1 interaction, disrupting hVps34/Beclin-1 complex formation, which is a key inducer for autophagy. Also, NO can lead to mTOR complex 1 (mTORC1) activation, which mainly inhibits autophagy (36,41). 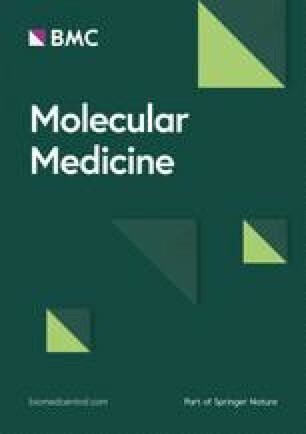 Our experiment confirms the inhibitory effects of NO on autophagy in macrophages through the activation of mTOR/P70S6; however, whether IRF-1-dependent NO signaling has other effects on regulators of autophagy was not examined in this study and certainly warrants further investigation. Additionally, our preliminary studies demonstrate that systemic high mobility group box 1 (HMGB1) levels from LPS-stimulated IRF1 KO mice are less than those seen in their WT counterparts. Whether these decreased HMGB1 levels account for the differences in autophagy that we observe in the present study is an interesting and potentially novel line of investigation to pursue. The present study focuses primarily on the role of IRF-1 and NO activation in regulating the autophagic response in LPS-stimulated macrophages; however, we also observed an association between IRF-1 and NO activation and the regulation of apoptosis in this setting as well. Therefore, further research into the mechanism(s) by which IRF-1 and NO affect apoptosis in LPS-stimulated macrophages is also well worth pursuing. In addition, while IRF-1 has been shown to participate in DNA damage-induced apoptosis in T lymphocytes (24), whether its activation leads to the same phenomena in immune cell types other than macrophages, such as lymphocytes and/or dendritic cells, in the setting of LPS stimulation also is undetermined. Whether manipulation the IRF-1 signaling pathway in the setting of sepsis can modulate the pathways that ultimately affect clinical outcomes also requires further investigation. Specifically, immune cell apoptosis, and the subsequent immunosuppressed state that occurs as a result, is increasingly being recognized as a key determinant in septic outcomes. While the current study, due to the nature of the model utilized, does not investigate the role of IRF-1 in this sepsis-induced immunosuppression, future studies along these lines would be interesting to pursue. In summary, we define a novel role for the transcription factor IRF-1 in regulating autophagy in LPS-stimulated macrophages. The ability of IRF-1 to impact this important cellular process may prove to reveal novel therapeutic targets in the persistently difficult clinical problem of sepsis. Financial support was received by The Howard Hughes Medical Institute Physician-Scientist Award (A Tsung) and by the American College of Surgeons Faculty Research Fellowship (A Tsung).